The Sweet Bookshelf: He's Here!! Well folks, he's here. My baby is FINALLY here. After a hellish pregnancy, and natural child birth, our little baby boy is here. He loves to eat. He gained 2 lbs in 3 weeks! What an oinker! He smiles and laughs every time his daddy gets home from work. Cutest thing, EVER. 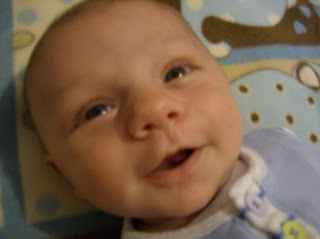 He was born Feb 2, 2011. Weighed 7 lbs 10 oz. 20.8 inches long. His favorite book is Goodnight Moon by Margaret Wise Brown. He falls asleep by the end of it EVERY time! During my pregnancy I was SO nauseous the whole time I literally couldn't read. It was awful!! I've never felt so sick in all my life. But I am so grateful to be feeling much more normal now, and I can't wait to pick up my first book in SO many months! I will be posting my reviews soon of these first reads. Thank you so much for sticking with me. Please let me know in the comments what you would like to see here on The Sweet Bookshelf so I can make it better for you!! Post more pictures of him and I'll be happy! So sad about not being able to read while pregnant! I haven't been reading too much either but that's because I'm just not focused enough or I'm too busy getting ready for our little boy to join us or I'm busy resting cause boy am I tired! Sebastian is adorable! I remember those early months of pregnancy when I was SO tired and just couldn't seem to get anything done. Just wait until you can read together! OMG GORGEOUS ANGEL. Congratulations! I am so happy for you and for your family. So good that he is healthy. Awwwwwwww, Mary, he is so utterly precious and adorable. So gorgeous. <3 And I absolutely love the name Sebastian. Great choice! Congratulations!! I am so happy to know everything is well, I checked back here every so often and was a bit worried. Hey, thanks for stopping by my site & for the sweet comments. Nice to "meet" you! Speaking of sweet, that is one handsome young man you've got. Hang in there; think you said he's 9 weeks, and things do tend to get easier around the 3 month mark. You're already well ahead of where I was at 9 weeks having (a) the "Goodnight Moon" routine in place already and (b) a baby who actually naps, for that matter! I heard you were really nauseous. I am into raw honey and cinnamon. It might help. I started several months ago and have felt good about it. Good luck with your baby!